As a Georgia Realtor feeling the first effects of the downturn, I realized I would have to do something extraordinary to attract buyers to the two new infill homes I had listed for a builder friend. Although the houses’ flyers were disappearing at a high rate, few buyers were calling to tour the homes. And those that did call hated having to wait for me to arrive and unlock the homes. There had to be a better way, so I spent months pondering the dilemma and reviewed possible products that could help sell the houses. How could I attract more buyers to these homes? But I was asking the wrong question! I didn’t need to attract MORE buyers– I needed to capture the ones who were already considering those gorgeous new homes. Could I capture these “drive-by” prospects by providing what they want—instant access to locked homes? Could I do this without compromising the security of the home? And would the prospects exchange their personal identity information for the opportunity to tour the home independently, without me escorting them? And so Call-A-Key was launched! Since builder properties were in short supply, the service was primarily used in the early years to sell REO properties for SunTrust Bank. 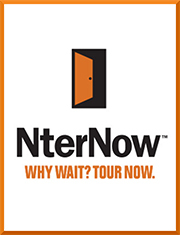 Today Call-A-Key, now called NterNow, is soon to let in its 40,000th prospect and is on hundreds of properties for sale and for lease in the residential and commercial marketplaces primarily on the East Coast.